The two young men arrested in a multi-agency bust on a drug lab operation may have been surprised, but at least one of their Strathcona neighbours wasn’t. Ironically, McDonald said he’s never really noticed the two men arrested at the house Wednesday morning. During the raid, OPP, Hamilton investigators and special teams moved in, striking against what they say is a suspected illegal steroid lab being run out of a modest home at 49 New St.
It’s the second such raid in Hamilton in a matter of weeks, and OPP Detective Staff Sergeant Scott Mills confirmed it’s no coincidence. The two arrested men — whom Mills declined to identify — were expected to be released on a promise to appear in court at a future date. Mills said investigators did recover suspected steroids from the scene as well as an assortment of “powders and chemicals,” yet to be identified by OPP chemists. Asked about the quantity of illegal steroids found in the unobtrusive, semidetached home, Mills would only say that in his opinion there were enough to warrant charges of possession for the purpose of trafficking. Steroids are a controlled substance, sometimes classified as a PIED — a performance or image enhancing drug. In other words, not the type one would associate with running a clandestine steroid lab. So-called clandestine steroid labs are more like packaging houses — pressing powder into pills, or mixing it in solution and packaging it for injection. The absence of heat, fire and volatile chemicals make them potentially less hazardous than other drug labs, Mills admitted, but he says a provincewide protocol requires police to err on the side of safety. On Wednesday morning the small street was chaotic and crowded, with the raid team shutting the street down and erecting blue polypropylene decontamination tents opposite the house. Men with hazardous material suits moved in and out of the building, and fire and EMS waited for trouble that never materialized. 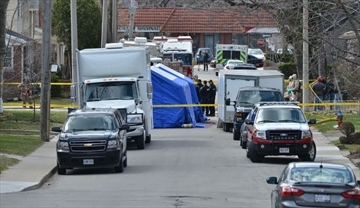 New Street, one block east of Dundurn Street, was closed to traffic for six hours by the operation, reopening just after 3 p.m.
Wednesday’s raid follows a similar operation at a larger, newly built home on the Mountain March 22. In that raid, police say they found steroids, cocaine and methamphetamine. Two people — a man and a woman at the Upper Wellington Street home — were arrested and face drug possession and trafficking charges.